Apple View is the West Annexe of Temple Farm. It had originally been built as a cider house we think about 100 years ago! We had more recently used it for storing of all things Bramley apples. 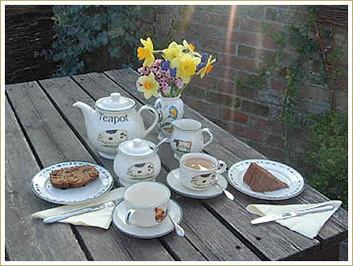 After your long journey we are sure that you will be ready for complimentary tea/coffee and cake which can be taken in either the garden on a nice day or the lounge if you prefer. Why not treat yourselves to a country break with us here in Somerset -Land of the Summer People - as it was known by the Saxons. Enjoy an evening relaxing in the garden after a warm balmy summers day, see the stars before retiring to bed. Wake up to birdsong and watch the mist rise, perhaps see the wild deer drift through the orchards and fields before enjoying another hearty farmhouse Breakfast.